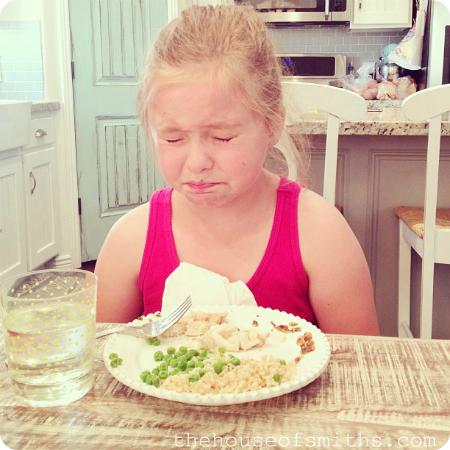 School vs. Home Lunch - How Do YOUR Kids Do It? I seriously can't believe that Summer is over. Our twins started school Wednesday and they were beyond thrilled. 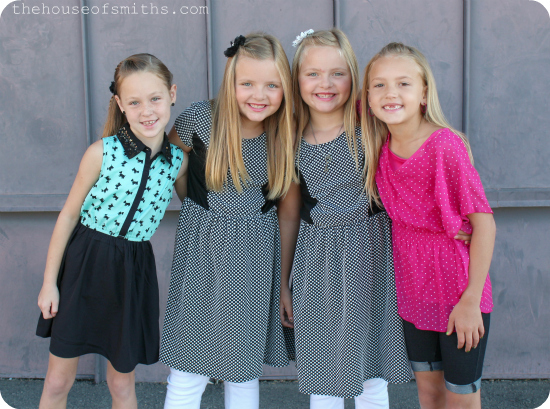 I could barely contain them in the backyard for 5 minutes, while I frantically took pictures for our annual "back to school photo shoot" I like to do, before they started whining about how much they wanted to hurry, so that they could see their friends. 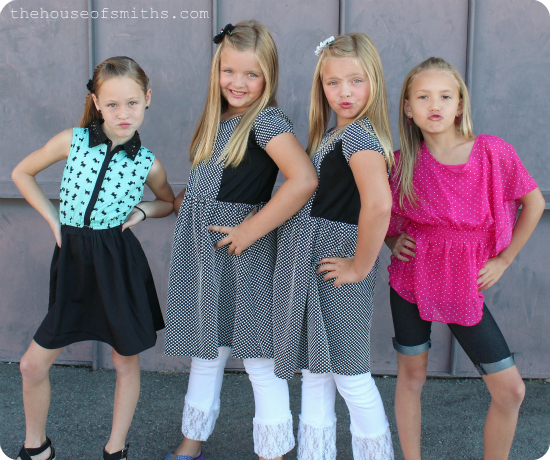 Oh, wait... SIGNATURE SASSY POSE! Okay, NOW all is right in the world. Alright, so I know that basically EVERY school year is going to start out the same. This being said, it SEEMS like I should have a handle on all the things I need to buy/do before my kids actually head back for their first day... but I'll admit, this time around we were seriously scrambling for pencils and paper to shove in backpacks we bought the night before, as we walked out the door. Please tell me I'm not the only one. I'll be honest and say that I'm just grateful that I didn't have to pack any lunches that morning... or for that matter, most days. Yup... my girls are school-lunch kiddos about 90% of the time. Cason and I have decided to have our girls buy school lunch, because we have some "not-so-adventurous" eaters around our house. While this sounds like backward reasoning, it's actually sort of a lesson in tough-love. Let me stop here and say that I KNOW half of you will support this next paragraph, and the other half of you will just think that we're probably cruel parents. Either way, just know that this is what's worked for our kids, and so I thought it was worth sharing. "Allowing" our kids the "opportunity" to experience other peoples cooking, and different kinds of foods, "encourages them" to try new things that they normally wouldn't. Every so often throughout the year they'll chat with me after school and tell me that their lunch was yucky, so they didn't finish it all, but for the most part, they eat what is offered, (which is a pretty great selection) and it has done WONDERS for us at home. we've grown leaps and bounds from where we used to be - which was usually in a puddle on the ground by the kitchen table, crying over the fact that we even had to "TRY" something green or new. Whew, so glad those days are over! How do YOUR kids do lunch at school? Growing up, I was brown baggin' it almost everyday, but I know nowadays almost everyone has actual lunchboxes that they reuse over and over. So my question is, if you have kids that take lunch to school, what kind of lunchbox do they use and why? An inquiring mother wants to know! Here are the three options that I'm exploring, for those days when my kids decide they want to take lunch from home, but I'd love to hear your thoughts if you have feelings one way or another. 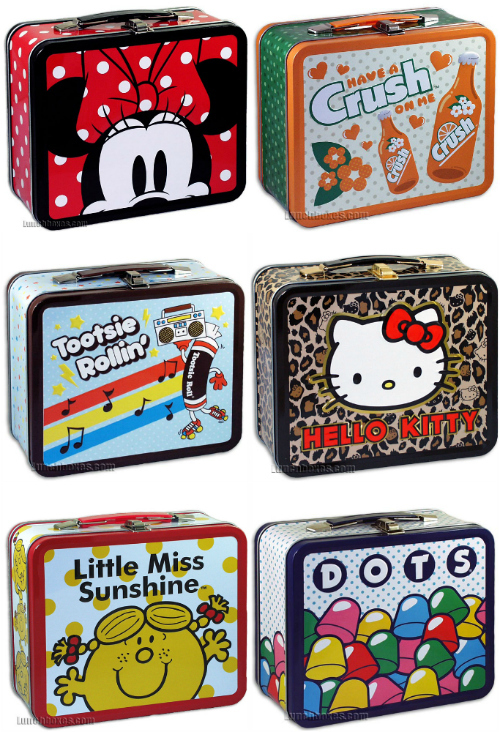 Metal Lunch Boxes - Once classic, turned nerdy, then vintage, now COOL. The downfall?... I feel like I remember metal lunchboxes having a di-stinct-stink after a while. (?) Maybe I'm crazy. 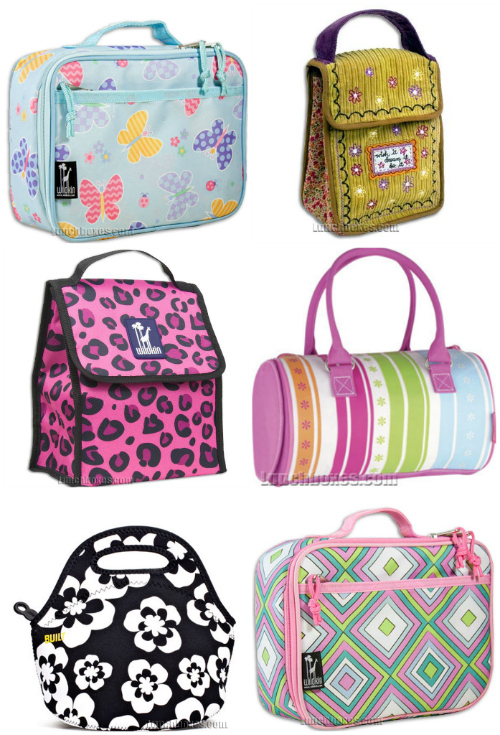 Insulated Lunch Bags - The mini version of a soft-style cooler and probably the most popular. Some resemble the brown bag lunch idea, others are a simple square with a cute print. I feel like the good thing about this options is that they keep cold foods chilled for longer, especially if you throw in a little ice pack... BUT, I also feel like they wear out faster and have a tendency to rip/have broken zippers/stick-less Velcro after a few months. Bento-Style Boxes - Food no touchy! Not a good explanation, but it's honestly what I think of when I look at these funny little compartmentalized boxes of perfectly placed foods. Have parents and kids in your school gotten into these Japanese inspired, "boxed lunches?" Okay, in all fairness, no kid I know is gonna 'get low with the Bent-o', if it comes packed with all of that raw fishiness like in the picture up there... but that's not the kind of Bento box I'm talking about, I'm thinking more like these Laptop Lunch Bento style boxes. Have you seen these? I think that they're so cool! For a somewhat OCD personality like mine, that thrives on everything being organized, this is visually SO appealing. Also, the possibilities of what you can pack are endless. The dip/dressing cubes and the silicon cupcake style holders are nice for those little extras, and keep things separated so they don't get soggy. Anyone actually have one who can weigh in? Any trouble with leaking? For the parents who pack home lunches: Do you prepare stuff at night or in the morning? Are you ever feeling like you're constantly buying food for lunches, trying to figure out new exciting things for your kids to try or spending tons more money, than if you were to just have your kids eat at school instead? And at what age have your kids become responsible for making their own lunches? I've been using a bento-like lunchbox for a couple of years and love it. I just bought a new version with a built-in ice pack, which is a bonus since ice packs take up so much room. We still use an insulated lunchbag and they last at least a year. School lunches are expensive here ($3.25) and we have three kids so it makes sense for them to bring lunch. Not to mention my 11 yo son would need two lunches now, lol. I make them the night before because it does take some time to put together, especially since they all like different things. I try to vary their lunches day to day, but keep the protein/cracker/fruit/small treat formula. My 11 year old will help sometimes, but he loves when I make it for him. Or, he's pulling my leg to get out of it! Packing lunches when my daughter was in preschool was so stressful. I never felt like I was doing a good job of putting good food together and I did feel like I was constantly buying food. She has a metal lunch box (check out Old Navy for cute and cheap styles) and it does not stink. The ones that stink are the insulated ones. She's only been in Kindergarten a week and she's been eating school lunch and I LOVE IT. I love it so much she's now eating breakfast there too. I've already noticed that she's more willing to eat what's on her plate at dinner. I think it's great! This has some great ideas for containers http://www.100daysofrealfood.com/2012/08/24/my-favorite-school-lunch-supplies/ I love the ziploc divided container and the smoothie pops! I never pack lunch at night, but that's a new goal for me this year. My kids prefer lunch from home and when I see what they serve at our school - I just wouldn't let them eat that every day. The kids at our school may be offered a balanced meal, but that's certainly not what I see most of them eating when I eat with my kids. Apologies in advance for the novel I'm about to write (but you asked a lot of questions, lol!) Oh my goodness, you had me cracking up with that teary, gaggy picture over what? Peas?! I know it WELL. I actually had to make a sign that has the "rules of the table" and rule number one was NO CRYING ALLOWED! My daughter would literally FALL DOWN on the way to the table in a heap of tears just at the merest glimpse of anything on her plate that wasn't beige. All three of my big kids have their own quirks about what they will and won't eat, but I'm seeing my 11 year old finally start to go through a maturity process with his taste buds and I think that the others will do the same as long as we keep modeling good choices and offering opportunities for them to push past their comfort zone, while still feeding them enough of their comfort items to keep them growing. As for what/how/when/etc, my 11 yo loves hot lunch because he prefers hot food to cold, so he does that 4-5 days a week. My two others take laptop lunches stashed inside Crocodile Creek lunch boxes. The CC lunch boxes lasted us FOUR YEARS of daily use before they kicked the bucket (we just bought new ones this year) and the laptop lunchboxes look brand new after three years (again, we use them every day). I always WANT to pack lunches the night before? But I always end up doing them the morning of, because I just can't bring myself to mess the kitchen up ONEMORETIME after dinner is finished. We use the bento boxes (with insulated lunch bags). My kids eat a lot healthier and more foods than at home since we started last year. The only extra time for me compared to regular lunch is the thought of what cool thing to do the next day. I use the one time use plastic containers with lids for dips or sauces. I find mine at Target. Throw an ice-pack in...good to go. Hope you find the perfect fit for your fam! We used a bento box last year but I'm not going to this year. My daughter was a little self conscious about it the whole year and I didn't realize. Plus, I had grand ambitions that I was going to make fancy lunches, but she pretty much just had a sandwich, a fruit and a snack item every day. This year we will continue to use the insulated lunch box, but I am going to invest in the reusable sandwich and snack bags. I saw some online that can go in the dishwasher. These are kind of pricey, but I'm going to investigate and see if I can find some cheaper. I've been doing a sort of bento type lunch and it's going pretty well. I do it at night, actually I try to repack the lunchboxes as soon as they are all home from school! Sistema lunch cube. Its like a bento box or laptop lunch box but without all of the lids that get lost or left at school or accidentally thrown away. The cube itself is tight but the interior areas aren't spillproof so I picked up some of those tiny containers for sauces and such. (There is also a "daiso" type store on 90th and redwood rd that has a bunch of cute bento bottles, grass, cups, rice molds, etc.. For the days you have time to do some cute luches). I put the cube, an ice pack and one of the sistema bottles in an insulated lunch bag. Sometimes we get crazy and fill a thermos with milk and a container with cereal, or a thermos of hot water and a cup of noodles, or even a thermos of hot soup! (I found the lunch cube and bottle at old navy! But you can find them online too...google sistema lunch cube). I finally bought an extra so now i don't have to do dishes in the morning when we forgot to wash the cube out at night! Good luck! My kids are not kids anymore, but I remember school lunches! School food is usually VERY unhealthy. Their nutritional guidelines are set by state and federal rules-and they are not about optimum health; they let too much sodium and high fat dairy and white carbs steal the show. My kids and I would pack lunches right after dinner so we could clean everything up all at once. Most years they used a soft sided "box." I use a bento myself. We are definitely brown baggers in this house. With school lunches avg. About $3 it adds up fast. I bought a lunchbox for my daughter last year from old navy and it is still in great shape after washing it several times. I try to switch up the fruit each week. She is able to use a microwave to heat up food so that adds a little more variety. I definitely feel she is getting a more filling and nutritious meal than what is offered at school. the soft sided ones are the BEST! even if you have to buy 2 for each kid, AND you can throw them in the washing machine, if you have to. (on gentle) and they fit nicely into the backpack after lunch. good luck figuring it out. Great post, I have had the same questions! They look great, but how do they work out in the "real world!" I am a lunch packer, but my kids would rather be allowed to buy. I think the school lunches are rather "kid friendly" (chicken nuggets, pizza, nachos etc) so they like it better than the carrot sticks and yogurt that I send. Our school lunches are far from adventurous. Plus I like packing since I know what is and isn't being eaten since the leftovers come home. We use both metal and soft sided lunch boxes. Actually the metal ones are easier to clean, but harder to keep stuff cold. The soft sided ones get stinky/sticky and if you get a tear in the liner? fuggetaboutit! As for packing.. I am a 'stuff it in the bag at the last minute!' girl. We keep a whole stash of grab and go stuff (cheese sticks, granola bars, cheese and crackers, little bags of cookies/chips/popcorn, juice/milk boxes, fresh fruit/veggies) and just throw together any combination of a protein, a carb and a fruit/veggie, plus a drink. Ta-dah! Instant lunch! Here in Australia schools don't offer lunches, so we aussie mums make our children's lunches everyday. My son takes his in an insulated lunchbox while my daughter has a bento style lunchbox. I make the lunches for them every morning and generally stick to the same thing most days (a ham and salad roll, something I've baked (brownie, muffin, cookie etc) a yoghurt, piece of fruit and some cheese & crackers. And yep, some weeks I do feel like all I ever do is buy food to put in lunch boxes! My daughter used the Laptop Lunches Bento box with an insulated bag from junior high through high school :) Some parts could be made the night before, but I put it together in the morning. She loves Japanese food, so we bought some bento cookbooks and she marked all of the recipes that she wanted to try. It was worth it so that she wouldn't have to eat the processed, toxic food served at school! Unfortunately, our public schools here in East Texas do not serve very nutritious food. Mainly it's chicken nuggets, hamburgers, chicken fried steak, pizza, corn dogs, and vegetables boiled beyond recognition. Not only do I not want my kids eating a steady diet of that, but they don't like it much either, since they are used to eating healthier food at home. So we pack lunch just about every day... We use the insulated bags, but like you said, Shelley, they tear after a month or two. We pack sandwiches, fresh veggies, fruit, sometimes cheese, chips or a cookie, and bottled water. I also have some "Cereal-on-the-Go containers (from the Container Store) that we occasionally use, cause my kids consider it a treat to have cereal for lunch! I am curious about the Bento boxes - it seems like everything would leak into each compartment and make a soggy mess. Anyone with any experience please let us know! I have a second grader as well and we have been using the laptop lunchbox along with their insulated bag since day one of kindergarten. We are very happy with it. Pros: it holds up very well, is easy to clean, comes in fun colors and has so many options of what to send for lunch and I see what got eaten and what not.Granted it is more work for you and planning ahead but I think it's more cost efficient than buying school lunches that mostly won't get eaten. I usually prepare most of it the night before but throw it all together in the morning time. We are trying to eat somewhat healthy over here and this is what works best for us! I do a combination of things for lunches. I pack a lunch for my kids 90% of the time. I have a senior in high school who will not carry a lunch box nor will he return any of my "dishes" home. He would much rather eat at Wendy's every day. So I make his lunch into baggies and throw it in a plastic grocery bag. He throws everything away when he is done. For my fourth grader, he loves the Bento style lunch boxes and usually tells me what he wants in it (ie leftovers or a bagel sammie and grapes, etc). He is a big eater and I can cram a lot of food in that box. Wow I never really gave that much thought about school lunches. My oldest who is now a Sophmore in college bought lunch every day all through high school. He ate the same thing every day but he bought. My youngest who is in 9th grade packed his lunch everyday last year and plans on packing this year. He is too cool for the Benten style boxes and takes an insulated bag. This years is shaped like a paper bag. It really keeps his lunch cold. The ice pack was still frozen when he got home yesterday. It's the best lunch box ever in my opinion. He takes a main item( yogurt,cheese and crackers or a sandwhich) a piece of fruit,bag of chips and a granola bar. He gets the side items ready the night before and I make the main item in the morning. Drink wise he takes water or buys a tea at school. You'll find as the girls get older that they may not have room for the metal boxes in their backpacks. I personally like the Benton style but my boys would think I was crazy if I packed their lunch in that. Oh also with that style of lunch box there are a lot of parts kids have to be responsible for. You would be surprised what ends up in the lunch room garbage cans. Have fun exploring all of your options. Well, first of all, our son is going into third grade, and he has taken his lunch to school every day since Kindergarten. My husband and I are teachers, we see what they serve in the school cafeteria, and we are not at all comfortable with him eating it. :) First of all, its absolutely NOT appealing to look at! Secondly, school lunches are pricey here ($2.75 if you include milk) and for what you get, it's not worth it, and finally, he just won't eat it. He's a definite picky eater - and since I am too, I get it. I'd rather have him bring his lunch and know that he's eating something that is healthy and nutritious, rather than have him not eat the school lunch and throw it away - wasting food and money. I know they changed the lunches to be more nutritious, but they don't seem any better judging by the amount of food thrown out by the students! He takes his lunch in an LL Bean Lunch box (the insulated kind) - and while we buy a new one each year as a tradition, all of the older ones are still like brand new in terms of quality - and i believe LL Bean has a guarantee on their products anyways. We toss them in the washing machine every once in a while, and that helps, I think. He doesn't pack his lunch - my mom lives with us (our Stay at Home Grandma!) and she packs all three of our lunches, although I help by having all of the items prepped and ready - she basically just stuffs the boxes and maybe makes our son a peanut butter sandwich once in a while. She's a definite blessing on our busy weekday mornings. My kids do a combination of bringing and buying lunch. I have a super picky son who only eats peanut butter sandwiches.....but he will usually eat macaroni and cheese from a thermos. Another popular thermos meal are cooked hotdogs placed in hot water. Then I pack the bun with condiments on it separately. Both my boys like that. I have found the trick with thermos foods staying warm is to preheat the thermos for about 15 minutes with hot or boiling water and put the lid on. Then empty the water and put the prepared food inside. Except for those hot meals, I almost always pack the night before, it just makes the mornings go a lot better. My more adventurous eater also likes tortilla roll up sandwiches...basically tortillas with meat, some shredded cheese or flavored cream cheese spread on it....roll it all up and then slice it and put in a container. I have always had my three children buy lunch at school, namely because of the variety offered and less hassle at home. When I tried to send lunch from home, I always spent more money. I can eat the same thing for lunch for a few days in a row, but not my kids. Often what they liked on Monday, they didn't want again and then they would eat the food earmarked for lunches as their after school snack. (Nothing like trying to pack lunches in the morning to find they had eaten everything the day before.) But the most limiting factor is that the schools in this area are nut-free. So no sandwiches using peanut butter, no baked treats with nuts and no items manufactured in a facility that uses nuts which excludes almost every granola bar on the planet! At least I know that they are getting a well balanced, healthy meal at school, often using vegetables from the school gardens that they helped grow. I think it is also social, so if the kitchen is offering a quinoa salad with black beans, they are more apt to try it because their friends are, at least I hope so! In our family here in Brisbane we use a plastic lunch boxes either a Tupperware sandwich keeper plus rectanglar , its like a bento with 4 compartments or a similar cheaper brand as the boys do knock them around but we have used the same ones for the last two years. Ours don't have any leaking problems as the compartment fits into the lid (but i would think that all the bits may get all mixed together if that lunch box gets tossed around like ours do!) but I know that friends kids have a tendency to loose bits and pieces and they spend a lot of time hunting up lunch boxes or silicon holders. We are lucky at as our school have a fridge in each classroom so no need for insulated bags...we have used them before and do find them harder to keep clean..the material stains over time. We make lunches while the kids eat breakfast as school starts at 8.50am its not a rush. A normal lunch would be a sandwich or wrap with a piece of fruit and some cut up vegies maybe cheese or crackers once in a while or a few pretzels. We like giving them a limited choice ie carrots or cucumber slices. It's not too exciting but our boys tend to want to rush through their lunch to get playing. We do let them have a lunch order bought from the school canteen maybe once a month and if they come shopping with me they help pick lunch ideas for fruit, vegies and sandwich fillings. Which gives them ownership of what they can have. Thanks for asking! For us making lunch at home is much cheaper and we know what is being eaten as they bring home anything leftover. We have used Laptop Lunchboxes since my oldest was in preschool (so this is our 5th year). We're still using the ORIGINAL one we bought back then - it's in great shape! We bought a second one a couple of years ago (for the second daughter), but the zipper pull broke off on that one already. Otherwise, they're great lunch boxes. I highly recommend buying an extra set of inner containers so you don't have to wash them every night!! My other favorite (and what I'd use if I was packing lunch, rather than my hubby doing it) is the Ziploc divided rectangle containers: http://tinyurl.com/kzhjqme (They're less expensive at Target - something like $2.48 for 2 of them.) I prefer these, just because there aren't so many pieces to deal with. We use these in a padded lunch bag (or even in the Laptop bags - they fit). Neither of these leak (as long as lids are on tightly - sometimes the kids don't replace lids and yogurt remains get all over the inside of the bags :( ). My hubby insists on packing lunches in the mornings, because they're "fresher" that way. If it was up to me, I'd do a lot more the night before, but as long as he's doing it, he can do it his way. I think our school lunches are $2.75 this year, so we definitely spend less than that on homemade (and much healthier!) lunches. My daughter is in first grade and said she wants to pack lunch. We look at the lunch menu at school and if she doesn't want to eat it we pack lunch. I've pinned a ton of stuff just for different ideas on my Pinterest board "school lunches for kids" and they are easy, healthy and fun. The lunch box has come empty for far. I would also love to know about the bento boxes. I want them so bad! I'm using Rubbermaid containers right now and they don't fit in her lunch box right. We got a $10 insulated one at Walmart. It's a bag with handles. I love it. It stays cold for 10 hrs. So you don't have to worry about lunch spoiling. Good luck! 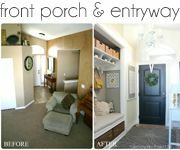 We go the insulated route - specifically the pottery barn retro. The size is perfect and they hold up. I just replaced my oldest son's after 4+ years of use (and only because his little brother and sister have the retro and he had the classic style - which doesn't fit as much). It hadn't even worn out! I just figured after 4 years I could justify replacing it. Regarding smell - if they get musty I wash them in the machine on gentle and let them air dry (even though the tag says not to.) I've never had a problem. We pack lunches most days, and he does cafeteria a couple days. 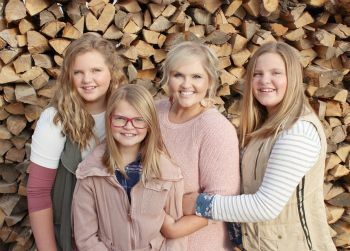 I have six girls, and this is the first year that they are all in school! Yep, I have a sophomore in high school all the way down to a kindergartener. I make their lunches (it's a small private school with no real cafeteria) everyday, and do it the night before. I found these great insulated, soft side lunch boxes at Costco that came with a Bento box inside. They aren't very pretty, but we've loved the Bento style! I decided I would pack them instead of having the girls pack them because I would rather they have time to do their other chores (each girl has a kitchen chore & a bathroom chore, plus they fold and put away the laundry). 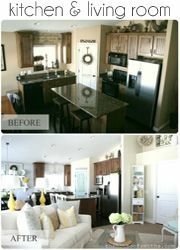 Plus, my kitchen is too small to have six kids each making their own lunch! I do it assembly line style and it really doesn't take too long that way. Each day I try to pack a fruit, a veggie, and then a main dish and a snack. Usually it's bell peppers, cucumbers, carrots & celery with hummus, a seasonal fruit, a banana wrap (whole wheat tortilla, PB & a banana all rolled up) or some other sandwich or occasionally pasta or quinoa salad, and then a homemade granola bar or trail mix for a snack. Giving your kids school lunch probably costs you three times more than it would cost if you made their lunch at home. I use the laptop luches regularly for myself and my husband. I LOVE them, but found it was too much for my now 2nd grader. Either food would come home uneaten or I wouldn't fill it completely and it was just a large box to transport back and forth from school. The dip container and one of the fruit/veggie containers do come with lids and I haven't had any trouble with them leaking as long as they are tightly sealed. I do have some smaller bento boxes that I use for my Daughter in the same fasion as the laptop lunch boxes - I seperate with silicon cupcake liners or even smaller containers similar to the dip containers above. You can find them on Amazon or I get a lot of my bento items from the 'allthingsforsale' website. The planet box (also found on amazon) is a great one for kids too. very similar to the laptop lunch, but not as deep and is made of metal instead of plastic. As far as food prep - I prep all my fruits/veggies/etc ahead of time (clean and cut them and store in fridge) but make her sandwhich in the morning and put together the rest of the food in the bento box. Prepping as much as you can ahead of time really cuts down the time in the morning. I make my kids' lunches as "fun" as possible - sandwhiches cut with cookie cutters and fruit put on a decorative stick really helps. Their lunch boxes come home empty about 95% of the time and I know they are eating good healthy foods (with a bit of chocolate or special treat included). My girls (4th grade and 7th grade) take their lunch almost everyday. I have nothing against school lunches - we pack for 2 reasons: 1) My younger was drinking the milk, eating the bread and THROWING AWAY the rest of her lunch every.day. I can at least pack something she will eat. 2) My oldest consistantly was the last group through the lunch line, so she had 10 minutes to wolf down her lunch and no "down time" to visit with friends. Packing a lunch means she has the whole 30 minutes to eat and visit. We pack most of the lunch the night before and I usually make the sandwich in the morning (no soggy bread!) We tried to have them make the sandwich but that was too much drama in the morning - so they pack everything else the night before. They both have the 31 Gifts insulated lunch bag and they have held up well. I packed school lunches for my kids until they were in junior year of high school and were allowed to go off campus to eat. I would pack lunches in the morning as it seemed to be fresher in an insulated lunch bag. I tried the lunch food at school and thought I was eating cardboard. It turned out it was a hamburger. I like the bento boxes but these were not around when my kids went to school. I liked knowing she was getting something tasty to eat such as a peanut butter sandwich, strawberries, cheese squares, grapes, clementines that she could peel and a little treat such as ritz crackers. I watched most kids throw out the majority of those school lunches every day. We haven't *quite* gotten to the school lunch phase, though I know when we do, my kids will have a packed lunch, because the school they will go to does not have a cafeteria. I don't know what we'll do (so I will be reading the comments!) but when I was growing up we just used a couple of tupperware containers, or when I was very young, at one point I had a plastic Muppets lunch box. We had to make our own lunch, and that consisted of as many sandwiches as we liked (at one point my brother was eating a loaf of bread or more a day) and fruit. There were no other choices, haha. I do remember some kids having a thermos of soup or other hot food. My daughter is starting 1st grade this year. Last year in kindergarten I'd say she brought her lunch more than she bought it, although she did buy a good amount of the time. I feel like I save money with her bringing lunch everyday rather than buying, but buying is obviously easier! She's not that much of a picky eater, but she doesn't like the traditional sandwich all too much. In pre-k she had an insulated lunch bag, last year she had a tin one, which I loved because her lunch would spill a lot from her not closing her food thermos all the way and its so much easier to clean. But after seeing all of these lunch ideas on pinterest (like sandwich kabobs and roll ups) I wanted a lunch tupperware type container that is separated into sections, so I grabbed one at Walmart, but realized it wouldn't fit in her lunch box. Of course being in Walmart there were lunch bags 2 shelves up form the containers that fit perfectly! So we'll see how that goes this year. I did love the tin one though, it did pretty well last year that I could use it again this year. Good luck in your lunch adventures lol. p.s.--I'm a new follower to your blog an I love it! We've tried all of the options you're considering. My kids are in 10th, 7th, and 6th grade. Metal lunchboxes seem to break just as fast as the soft boxes. I buy soft boxes that can be washed. The tall sack style ones are hardest to clean. We replace them about every other year. If they loose it, they buy a new one themselves. We usually do a lot of prep on Saturday and Sunday so all they have to do during the week is assemble. Pizza muffins and taquitos are the current fave. We've tried many systems for packing them over the years. The one that works best is to assign packing to 1 person for the week. For some reason, making them responsible for their own always led to tears and yelling. It's been nice to see them become more considerate of each others likes and dislikes. They are highly motivated to get them right because they know they're more likely to get theirs right when it's not their turn to pack. I started out supervising (I never actually did the work) the packing, but now they are completely independent. Let me just say that I hate packing school lunches, I think I hate it even more than all of the paperwork that comes home with my children on a daily basis! I usually start the school year out by packing their lunch daily, I'm full of new and healthy ideas to pack and this seems to work. Well, at least for the first week. (wink wink) Once I've lost momentum, I will let them get a hot lunch at school about 2-3x per week. I absolutely LOVE http://www.easylunchboxes.com/. They are dishwasher and microwave safe and they fit nicely into the Lands End soft sided lunch box. I don't like metal lunch boxes, although cute and retro, they tend to rust, and yes SMELL! There are so many good lunch box options out there, I'm sure you'll find what works for your family! My little girl is just starting preschool but I have dove in with Bento. Love the laptop boxes. I have been 'practicing' here at home so that she is able to open everything once school starts. I am having fun using it as a creative outlet also! I don't know about the rest of the country but here school lunches are EXPENSIVE! Especially with 3 kids in school. Our boys go through the menu at the beginning of each month and pick one day a week that they want to have school lunch. That way I know it is something they will eat and it is more of a treat for them. Otherwise we pack their lunches the night before. I try to vary their fruits and veggies otherwise they are perfectly happy with a similar thing for lunch every day. We use the insulated lunch bags and have a few extra (bought on clearance) in case they break. Works for our family! We're a bento family. My 14 year old puts his straight in his back pack, my 11 year old made a duct tape case for hers. I had them make a list of everything they like and I mean everything. We pack them at dinner time and put them in the fridge so only 1 kitchen clean up. It works we've done this for 2 years and I have made them progressively more healthy. Costco is my friend. Good luck. My best tip, go eat lunch with them a few times for research. They eat/need way less food than we think /pack. My kid is also a not so adventurous eater, which is why I subscribe to the same mentality of her eating school lunch. She does take a brown bag lunch once a week so she can have her beloved PB&J. We use an insulated lunch bag because they are inexpensive (Laptop Lunch not so much) and easy, plus they can be squished and shoved in to tight spaces (metal is kind of infelxible). Also, bento box style is really cool in theory, and visually appealing, but unless you have a lid for each individual section, things can get out of hand quickly, (i.e. yogurt all over previously mentioned PB&J). So there you go, you asked, that's my answer. Easy Lunchboxes!!! We use the trays and the lunchboxes!!! I love everything about them!!! My kids bring their lunches! It would cost us over $100 for school lunches each month so we decided it was better for them to bring their lunches. I can make lunch and snack for them each day for around $30 a month! WAY more affordable!!! I do let them each pick out 2 days a month they would like to eat school lunch and they enjoy the special treat! I have to say I didn't want these for a long time, but now that I actually pack four lunches most days, I am so tired of ZIPLOCS!! And not just for the cost, but because I run out of them and because I don't always have the snack or sandwhich size when I need it...and because it takes SO LONG to ziploc up a sandwhich, cookies, a fruit, crackers or chips in each lunch times four lunches!!!! Seriously...it's so much easier to just place it all in a compartmentalized lunch. I love these because I've now been giving my kids a lunch variety over the sandwich/chips combo they used to get most often. And I DON'T buy the prepackaged stuff that is already more expensive (chips, cookies, crackers) I just buy the regular box and give them each a little in their compartments. Their lunches are now healthier and more variety. I went with the goodbyn because I wanted a ONE PIECE box...with 3-4 of them each day I don't want to wash 4x4 containers every day and I don't want to keep track of all of those lids etc. Mine aren't "spill" proof guaranteed although many said they still are...so I bought little disposable cups/lids to use for ranch dip etc. We pack lunches at night whenever possible because I like it to be in the fridge overnight so it takes longer to thaw out at school. I often have them make them (11, 8 and 5yrs) but I help with the sandwhich or other main items if needed. We put the goodbyn in an insulated lunch bag (mine have always lasted 1-2 years) but I will say some of the insulated bags are too small for the goodbyn. I've made all mine work but it's frustrating it's not a little better fit. I also never have room for water/drink so they buy milk or I stuff a water in the insulated bag...but again, it's a tight fit. Goodbyn makes a special water bottle but I use all the compartments so I didn't buy it. Good luck! We use EasyLunchboxes (google it) or the 3 compartment Ziploc containers. They can all go in the dishwasher. They work very well for sending things that would normally get smashed in bags - grapes, strawberries, mini muffins... If I send ketchup, PB or something like applesauce then I use the little throwaway containers. They still fit inside the main container and are pretty reasonable at Walmart near the plastic utensils. We use soft sided lunchboxes but not the character ones because they don't last long. I also get ones that zip along the top because they have been bigger to fit the containers I use along with a drink. I often freeze their juice boxes/bags to use as a ice pack. I would often let them choose 1 breakfast and 1 lunch they wanted at school each week. I bought the insulated lunch boxes at Costco as each of my kids entered first grade and needed a lunch. We still have them (my oldest is now a Junior in high school), with no rips, tears or broken zippers. I love how they kept things cool, especially with an ice pack. throughout my years of sending cold lunches, I've always required them to take responsibility and pack their own lunch. I just made it a part of our nightly routine and had everyone do it together. We decide all together what they want, so I can buy stuff at the store and always have the fridge stocked. They know that there are certain items, like gogurts and 100% juice Capri Suns, that are for school lunches only and are off limits for snacking on at home. I just love that I know exactly what they're eating and that I know it's getting eaten and not just thrown away, like school lunch often did. I don't have to pack kids lunches but I bring my lunch with me to work every day and I love my metal lunch boxes. Mine even have a thermos (or bottle but mine came with a thermos!) holder so it won't roll around and smash everything. 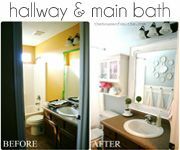 I've never had a smelly problem with it, if it starts to look dirty I hand wash it with hot water and scrub with dish soap, dry it and it's good to go. I also have an insulated lunch bag, I don't like it as much. It is harder to clean and the stitching popped so there is a big hole near the handles. I just put my lunch box/bag in the fridge when I get to work so I don't know about which keeps colder but if you have room for an ice pack either would work great I'm sure. Interesting! Sounds a lot like what happened for us! I had the kids eat at school because I felt that my boy really needed the social interaction and decision making of the lunch line and my girl needed to be less picky! It actually worked out quite well, even though I was never all that happy with the kind of food they served. However, having served the purpose, we decided to do packed lunches this year. Surprisingly, the kids were all for it! So, we got insulated lunch boxes - Lalaloopsy for my girl, Angry Birds for my boy - yes, I know, but it's what made them happy and what made the whole lunch thing cool in their eyes! Both ran around $9, so not too expensive! Inside the lunch boxes I use the Ziplock divided rectangle (3-compartment) box. I had done a LOT of research into what boxes/containers to use and in the end I decided on those. 1. The lid INDIVIDUALLY seals every one of the 3 compartments - but in one lid! This is important as my kids are far from careful when carrying their lunches and stuff sloshes around! In fact, in terms of practicality, this turned into the most important point for me! 2. They are inexpensive, if they get lost, it's not such a big deal! They are also easily available in regular local stores and go on sale every once in a while! 3. They fit the lunch bags perfectly, still leaving room for an ice pack (if needed) and cutlery! 4. 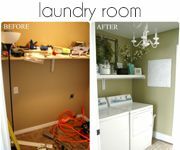 They are quite sturdy and perfectly reusable for quite some time, adding to the inexpensive factor! We are into it 2 weeks, and the kids have independently declared the packed lunches MUCH better than the school lunches, which is a little surprising as the school serves a lot of the more junk-food type items! My kids aren't nearly as starving as they usually are when they get home, so I'm thinking the lunch is holding them longer! So, I win either way now - the packed lunches are much cheaper, I can give the kids healthy, fresh, organic and balanced food for their lunches - AND they love it! I tend to follow a simple formula of a a fruit, a veggie, a little treat and usually a sandwich type thing. Also, my son loved to buy on certain days like "pizza day" so I would usually let him choose a few days each month to buy...sometimes more often if I was feeling lazy about making his lunch. Not looking forward to making lunches for all 3 kids as they get older but maybe I'll really have a good system by then...haha! When I was in school I used an insulated lunch bag and I still take one to work with me every day for my lunchs, It never gets smelly but I do wipe it out every night. When I was younger I didn't really like sandwiches becuase I found that by the time you ate lunch the bread was always wet and soggy. My mom would normally fill a thermos with soup for the winter and in the summer it would be yogurt and fruit and veggies, she also wrote me a note everyday in my lunch, and I looked forward to what the note would say! Sometimes if it was a bad day she would say hang in there and if it was a special day like a birthday it would be something fancy! Plus I always got some sort of treat like a small candy or a cookie. I feel like the homemade lunch made me feel special and I think its great your girls are excited to try new foods! Psh, my 3rd grader eats both breakfast and lunch at school! I am so with you! She gets a much more well rounded meal, and you can't beat the price. I am such a mess in the mornings that packing a lunch is the last thing I want to do. Once or twice a month she wants to pack a lunch from home, and so we usually just send the usual sandwich, fruit, juice box and crackers in her insulated lunch bag. Old Navy backpacks sometimes come with matching ones that clip onto it, they are awesome. Our school lunches are gross and expensive ($2.75), and I have three kids. Plus our lunch break is super short here in VA. The kids only get 25 minutes and most of it would be spent in line. Even with packed lunches, sometimes the kids don't have time to finish. My husband packs them the night before, so no running around in the morning for us. As for content, I make all our own whole-wheat bread and the kids love it. We're pretty basic with our lunches: meat & cheese or pb&j sandwiches with a fruit, yogurt, and water bottle. I don't buy fruit snacks or twinkies. We use mostly insulated lunch bags (I buy them on clearance at Target, I even got some for $1.50 a couple years ago). They last 2-3 years each. I've looked into the expensive bento style boxes, but I don't want to invest $$ into something they might lose at school. Plus, they aren't usually spill-proof, so kind of annoying that way. We like to keep it pretty simple here! We have heard very good things about the planetbox and have purchased them for our kiddos for lunch this year. My children went to a small private grade school that did not offer school lunches, so they packed a lunch every day. We used a small ice chest type lunch box with an ice pack. We had individual containers for items similar to the bento boxes and packed a sandwich every day with fruit or salad and some sort of sweet for dessert. They always ate every bit of it and knew to unpack their dishes when they got home so it would be washed and ready for the next time. I usually had extra containers in case they were not washed for the next day. 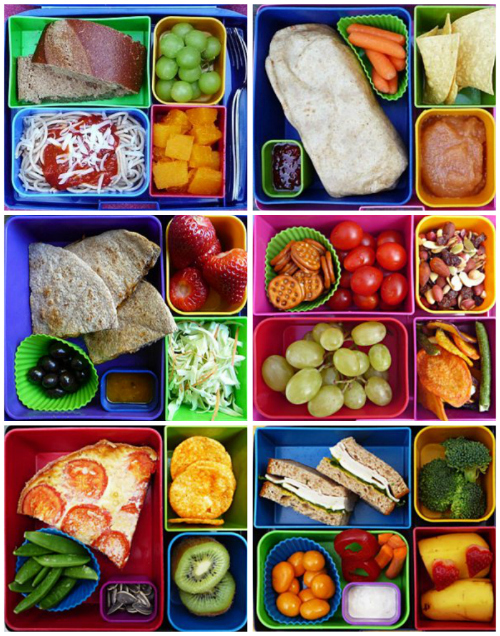 I love your idea to make your picky kids buy lunch so they get more used to eating different foods. Not only are they becoming used to trying different things, but you don't have to deal with the drama at dinnertime! I've been using the same zipper/insulated lunch bag for 3 years now and its holding up fine and not stinking at all. It's just a cheap kids one from Target, though I know I'm an adult, and not spilling/yanking/tossing my lunch around. I wipe it out once in awhile and its fine. If you want bento ideas, try @marineparents on instagram - their stationed in Japan and she makes AWESOME bento lunches/snacks for her 4 year old daughter and even sells some Japanese bento supplies on etsy. The last question got me! When my daughter started high school we asked her what we could do to help her manage her workload? And, the one thing she asked for "mom, can you make my lunch." I made her lunch (almost) every morning ( I tried the night before and she said the sandwiches just didn't hold up) for 4 years (with a Vera Bradley must have lunch bag)! It's the little things that help our kids get through school. A packed lunch. Loved the post! I have been thinking about using the only school lunch approach with my kindergartner who, after the first week of my sending lunches only at about 20% of what I gave her. Great idea! two of my three kids, ages 10 and 13, STILL want me to make them lunches almost every single day. my son hasn't eaten a school lunch in three or four years and my daughter takes hers 98% of the time. I actually prefer to make their lunches so i know what they are getting. i'm not very impressed by the lunches that are served at our schools so i know that by making it myself they are getting good, wholesome lunches in them every day. 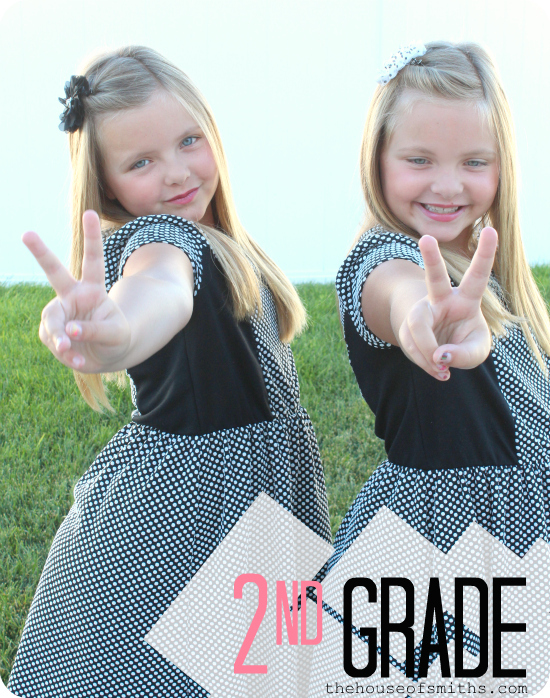 I have twins starting third grade this year (seriously, where does the time go?!) and they've always eaten both breakfast and lunch at school. It is easier on us, the girls, and our grocery bill! We do what is best for us as a family. I've always taken a lunch, so it was only fitting that my daughters do the same. We've been using these boxes http://www.bentgo.com/ and love them, they fit right inside these insulated bags, http://www.potterybarnkids.com/products/1283985/ which are durable, something that every mom needs. I don't have a set schedule for making lunches, sometimes the night before, sometimes the morning of, but we do plan out meals a couple of weeks in advance, so I'm prepared and ready to go. Sistema lunch bentos all the way. Those little boxes stay clamped tight- the only ones that have for us. Also they are cute, no BPA and generally pretty reasonably priced. We found our first at Old Navy but now purchase from Amazon. We like Contigo kids cups- another set we got from Nalgene had a valve that popped out- seriously could have choked my child- freaked out on customer service and they're STILL selling it!!! Will not purchase any more from them. Otherwise, it's insulated lunch bags with a cute ice pack inside. Wipe them out after use. Amazon has great bento tools, sandwich presses and cutters. Check it out! I have been packing my kids lunches for 7 years now since school lunch is not an option at their school. When they were younger, I loved the bento boxes from Laptop lunches because the kids would open their lunch box and actually see what there was to eat and ate more versus it just falling into the bottom of a bag. I used the bento boxes for about 5 years and when the Laptop lunches bag wore out, the boxes fit perfectly in a Lands End lunch box. In the past 2 years, the kids have moved away from the bento box. They tend to pack more of their own lunches, especially my daughter, so she knows what it is in there! I have both kids pack the majority of their lunch and snack the night before and then I ask them what they want as there main entrée. I make that in the morning, pop it in the bag and we are done! My son tends to eat the same thing day after day and my daughter really mixes her meals up. When she doesn't know what to have, she packs dry cereal and uses her milk from school! I love that idea. The kids are required to take a fruit and protein. The carbs come easily and I don't worry about the veggie because they are good veggie eaters at home, so we double and triple up at dinner. I don't want them to get burned out on fresh veggies! Just a personal choice! Hope this helps! Good Luck! I just got planetboxes for my kids and we LOVE them. They are a bit pricey, but they are very high quality. I can tell they are going to last a long time. My picky son eats so much better since getting one. He is even eating his veggie's as long as they are in his lunch box. It is also easy for him to open, which is a big plus. I am going to get a lunchbot for my 2 year old to bring snacks for while we are out. We use insulated bags every day, and they have already lasted over a year. No problem with smell. The big lifesaver for us, though, has been Sigg water bottles with the bottle top. Big upfront cost, I won't lie ($20), but my oldest has now had his for six years. We fill them with water to avoid the moneypit-that-is-CapriSun. The bottle top is pure genius: no parts to become unattached and possibly lost. Never once have we had a leak. I love them and would buy them again in a heartbeat. We let our kids buy their lunch once a week, whichever day they want. The big lifesaver for us, though, has been Sigg water bottles with the bottle top. Big upfront cost, I won't lie ($20), but my oldest has now had his for six years. We fill them with water to avoid the moneypit-that-is-CapriSun. The bottle top is pure genius: no parts to become unattached and possibly lost. Never once have we had a leak. I would buy them again in a heartbeat. I don't have kids, but I take my lunch to work every day. I have used so many insulated lunch bags and I hate that they are hard to clean and the lining always tears. I found a bag that I really like. It's the Built NY bag and is actually the bottom left one in your picture. http://www.builtny.com/. Why I like it: flexible to fit all sorts of containers, durable (neoprene material with a heavy duty zipper) and machine washable. We pack lunches. I'm a huge fan of LL Bean's lunch boxes and backpacks! They may not be the trendiest, but they make really quality gear and have amazing customer service. My 7 year old son had their lunch box last year and he'll use it again this year. It's in great shape. He had a lunch box from thirty-one the year before and all the insulation was falling apart by the end of the year. If that had been LL Bean, I have no doubt they would replace it. Not so with thirty-one. The same with Pottery Barn Kids. They have adorable gear, but there is a really short window for returns if you have any problems, which I think is insane considering how much they charge! My girls used to use insulated lunch bags but I have one child in particular that cannot remember to bring anything home. I can't afford to replace lunch boxes and fancy containers on a regular basis so brown bags it is. I prepare everything (except the sandwiches/wraps so they don't get soggy) on Saturday for the upcoming school week and line them up in the fridge. When they are eating breakfast the morning of I make the sandwich/wrap, grab their brown bag for the day, throw in the sandwich and they're out the door! I also let them pick one day a week they'd like to eat at the school so they can still have some of their favorite hot lunches. We use the Pak-it lunch boxes that freeze and keep lunch nice and fresh, a must have in Texas with fresh fruit and veggies. Then we use the Easy Lunch Boxes and a refill-able drink pouch to store the food in. Hope this helps! So, even though it's sooooo not environmentally friendly, I would send my son with a brown paper bag every day after 2nd grade when he would constantly leave his lunch box at school for days on end. He started Jr High now and it's not cool to take your lunch so he's doing the school lunch thing! HOORAY!! We make my daughter's lunch everynight and she has been taking the same insulated lunch bag since 1st grade. (She's now in 4th). It's still in good condition. She started making her own sandwich last year. Would you believe I not only woke them up with breakfast in bed, but also had to pack a lunch for my pickiest daughter (who we later found out had a mild case of Asperger's, which is high functioning autism)? So pickiness was her middle name. Thankfully, both girls 18 and 21 now get themselves fed and the oldest has learned how to eat pretty much everything. Except we still have to cross the salad finish line... She learned a lot from peer pressure of friends, who encouraged her to try a wider range of foods. But I know I would do a LOT to get our kids up and ready to meet the challenges of their school day! And now both are in college, and telling ME what to eat! We use Eco-collapsible silicone bento style boxes and I love them! My kids have never once bought anything from school, as it tends to be higher fat and more meat based then we would eat. We also try to eat organic and fresh foods (not processed) and school lunches are not organic and often have fried and formerly frozen food. I enjoy packing healthy and cute lunches for them and they like to help or make them on their own. They are 8 and 11. 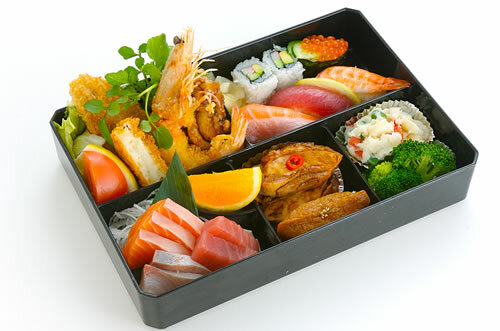 Both of my kids love diverse and ethnic foods and that beautiful sushi bento you pictured would be their favorite! Their friends who eat school lunches often have weight problems eating "size up" portion of school hamburgers, fries and chicken nuggets. Most kids in the lunch room just throw out the vegetable or fruit on the tray anyway.